So funny thing happened — I was doing this weekly comic review called “The Doomino Effect” and then I stopped doing it for like two years. 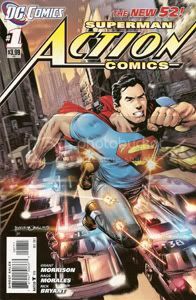 Speaking of looking back at the past, that leads me to Action Comics #1 by Grant Morrison and Rags Morales. Like Justice League #1, this story seems to be taking place in the past of The New 52. Unlike Justice League, this seems to be taking place more than 5 years in the past, because Superman has a silly cuffed-jeans costume. They’re also big loose rolls and not tight rolls, so I’m thinking that makes it late 90s. I might need some backup on that one though. I like this Superman. He seems to have a little more of a social justice angle to his “I am a Real American” schtick, which makes for something with a tinge of menace and therefore more fun than Super Boy Scout. Super Boy Scouts are lame. but as much as I do like this new version of Superman, I just feel like I’m reading another All-Star Superman or Superman: Birthright or some other reimagining of the Superman myth that really has no bearing on continuity. JIM DOOM: I will go through this 52 preview book, say the books that are coming out, and we say if we think we’ll give them a try or not. DOOM DeLUISE: Ok, I’ll play that game. JIM DOOM: And I should mention, for anyone listening in the Omaha area, that Legend Comics is doing a deal where you get one free 52 #1 issue for every three that you buy. DOOM DeLUISE: That’s a great deal. JIM DOOM: So for example, you walk to the counter with Action #1, Batman #1, Detective #1, and Aquaman #1, you get one of those for free. And yeah, it’s a cool deal, but I was too dumb to understand it. So then he picked up the list and had to explain it to me slowly so I would understand. I’m kind of dense sometimes. JIM DOOM: Well, Doom DeLuise, welcome back. It’s been a while since our last podcast. I actually didn’t even test out these microphones to see if they still work. I said is mine working? It’s been in a box. DOOM DeLUISE: Oh hey, sorry, I was spacing off. DOOM DeLUISE: Yes, it’s working. JIM DOOM: Is my microphone working? DOOM DeLUISE: [BLEEP], is mine? JIM DOOM: Oh oops, my headphones were unplugged. DOOM DeLUISE: Is my microphone working? JIM DOOM: Yours is working. 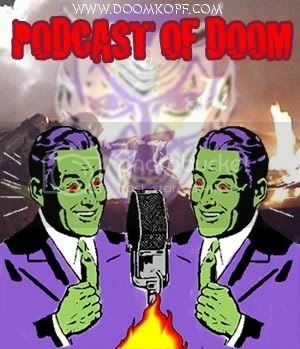 JIM DOOM: Are your headphones plugged in?